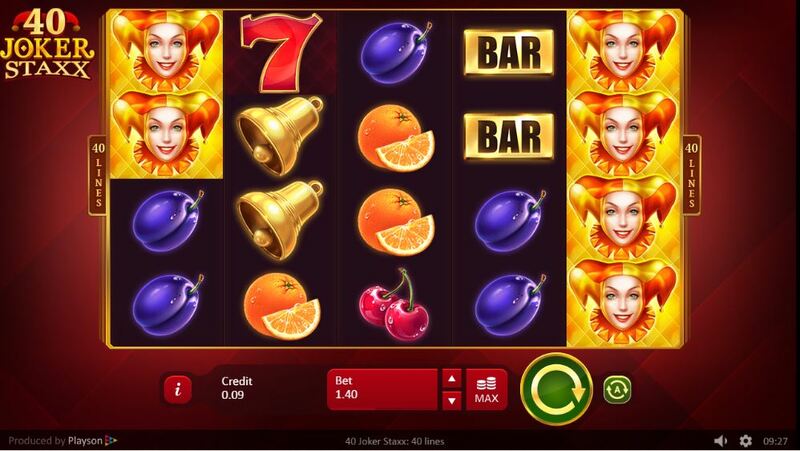 With an exquisite fusion of an uncluttered theme and modern vibrant graphics, PLAYSON provides its vendees with yet another revamped fruit-slots classic. A simple and elegant fruit machine with a unique feature -40 lines- serves as a great game for the audience to enjoy. The cast of the game is made up mainly of symbols in the form of fruit in addition to a number of bars and bells, while stars are scattered symbols and the best part is the joker head that acts wild. This Harlequin is a true fool and brings you big winnings. So, land many stacks of jokers on reels to get the big winning combinations. 40 Joker Staxx with its entertaining 3D animations and triumphant tunes provides a game environment that is captivating and enchanting. Click now to discover more about Easy Slots! Designed with simplicity in mind, the game comes in 40 lines with a 4x5 grid view, two main features are a scatter and a wild joker head; 40 Joker Staxx is a 5 (4) reel game with 40 pay lines. While playing the game you can bet one coin on each pay line and hopefully land a number of joker stacks to get the winning combination.